MC-TRANS-1RU - H.264 and MPEG-2 Multichannel Transcoder | AdvancedDigital Inc. The transcoder MC-TRANS-1RU is designed for IPTV-Live Streaming applications. 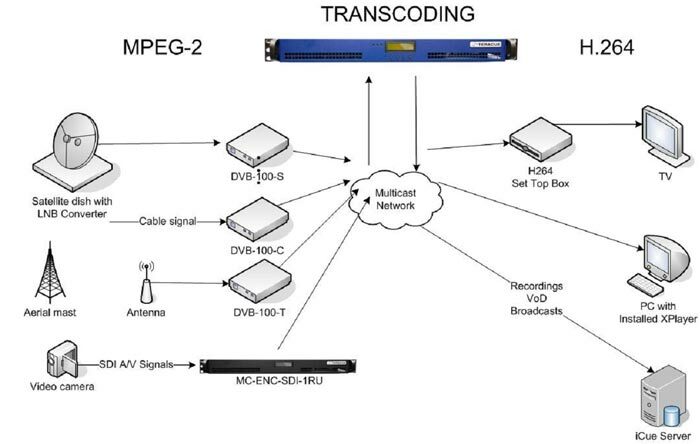 The transcoder is a network based transcoder and converts Multicast or Unicast streams from MPEG-2 to H.264 or from H.264 to MPEG-2. Thereby the user can set parameters like resolution, bitrate, bitrate type (CBR/VBR) or GOP structure (Group of Picture). Also the up- or down-scaling from HD to SD formats is supported. On-the-fly conversion of the used video codec, the bitrate, the resolution and the GOP structure, etc.